If consistency is your aim, maintenance is the game. Just like an annual health checkup at the doctor, your gas systems should get an annual audit to ensure optimal function. It is always better to proactively audit and manage your gas systems rather than react to potentially high-risk situations. Ensure your mechanical systems operate reliably at all times with a comprehensive gas maintenance program. What is a Gas Maintenance Program? MBS Engineering’s Gas Maintenance Program is a yearly auditing, testing and reporting service for your property’s gas system that identifies, tests and prevents gas related issues caused by aging or obsolete equipment. MBS starts by reviewing your gas map or mapping out your facility’s gas system. We provide a detailed report of all the gas system assets such as Seismic Valves, Gas Regulators, and Manual Shut-off Valves that detail your assets’ conditions, model numbers, and locations. Proper maintenance of gas lines, valves and regulators is necessary for a safe working environment. Gas line corrosion and leaks can easily go undetected for a long period of time, and can lead to catastrophic property damage and endanger your staff. In addition to preventing gas-related issues, maintenance saves money. We all know that repairing cavities costs more than routine cleaning; so don’t let your gas lines deteriorate. Look for a specialty contractor who can safely tackle complex problems and provide efficient solutions. 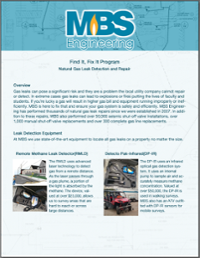 MBS Engineering offers tailored maintenance programs, designed specifically for each client, including those with complex plant and project support needs. By maintaining your equipment on an ongoing basis, we’re able to develop an intimate knowledge of the equipment, which enables us to repair or replace assets before they develop into bigger, costly problems.